Having crossed the bridge over the mill stream you have arrived at the Mill Pool and Place Mill is on the left hand side. 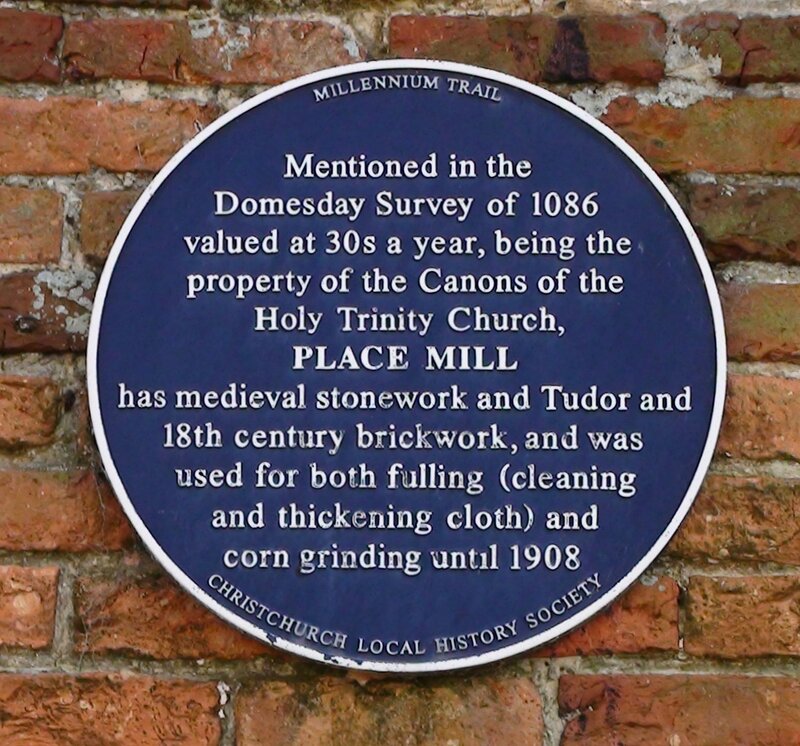 Place Mill is located between the River Avon and River Stour, sitting on the Town Quay, it takes the supply water from the River Avon via it’s mill race and flows, after powering the water wheel, into the River Stour. 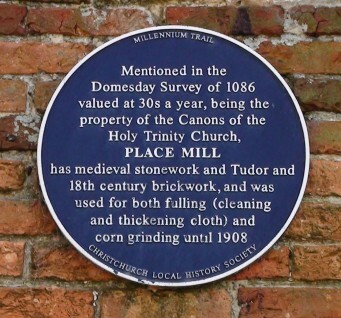 This Mill, along with Knapp Mill and Town Mill, is mentioned in the Domesday Survey with a value of thirty shillings. There have been various additions to the building over the centuries, Medieval stone work, Tudor and 18th century brick work. 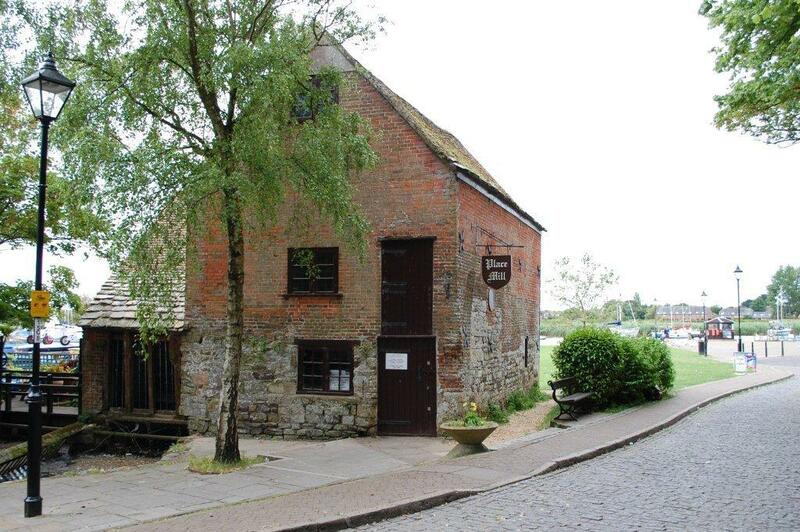 The monastic corn mill, later also used for fulling cloth for the wool trade for all those Christchurch mercers. It finished it’s intended working life of fulling cloth and corn grinding in 1908. The Mill has found a use over recent years as an art gallery and a workshop for an artist during the summer months, with the added attraction of a working water mill. Inside the building are still the mill wheel, wooden gears and mill stones. In front of Place Mill ferry boats run to Mudeford Sandbank, giving good views of Christchurch Harbour, and Tuckton Bridge. At Town Quay in days gone by all sorts of goods, especially coal, were unloaded when road conditions were poor making waterways of importance than they are today. On the Christchurch Blue Plaques Millennium Trail Leaflet1 this location is identified as number 21. 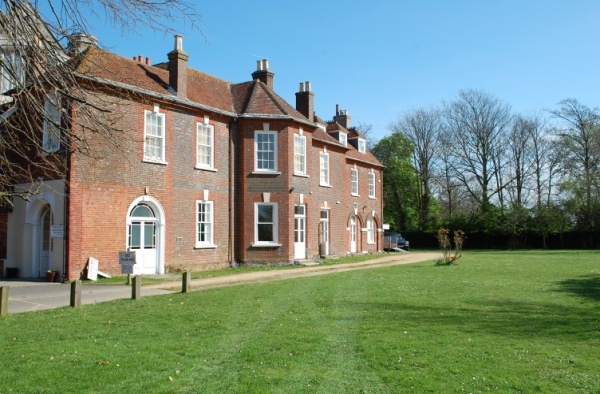 By retracing your footsteps back to the bridge over the mill stream you will see at gate to the left which leads into the Priory Car Park where this virtual tour began. 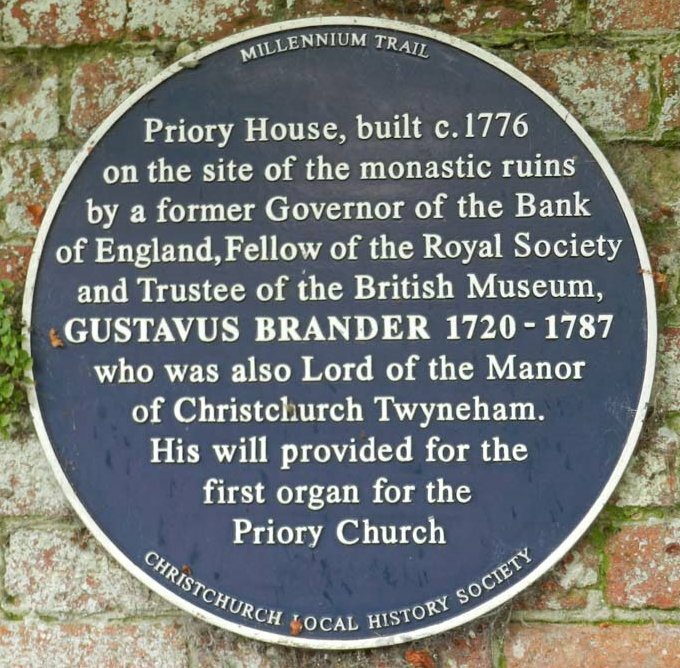 On entering the Car Park look to the right and you will see Priory House built by Gustavus Brander. In the process of the work he uncovered a number of buildings destroyed by Henry VIII. The most curious was a collection of bird bones but to this day the explanation for them is unknown. Priory House is currently used as the Parish Office of Christchurch Priory. On the Christchurch Blue Plaques Millennium Trail Leaflet1 this location is identified as number 22.